Hello! 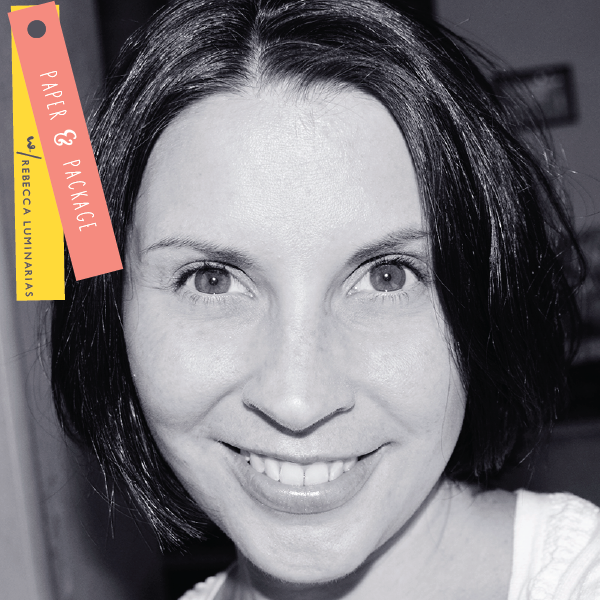 I’m so happy to be back with you today for my monthly Packaging Ambassador post. I thoroughly enjoy creating these projects to share with you and I hope you’re enjoying them, too! 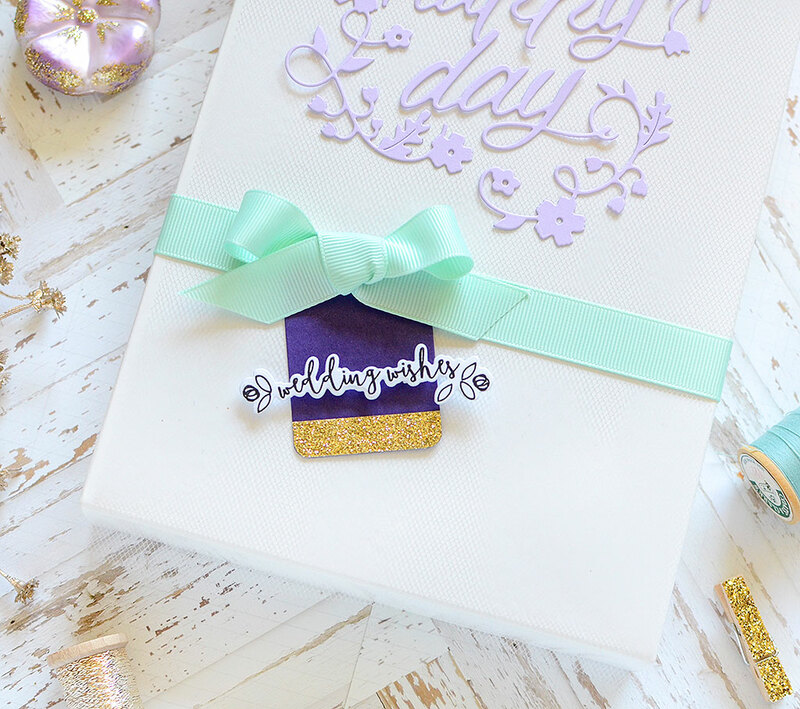 This month, I’m dipping into wedding season to show you 2 samples of package toppers you can make that feature one large die. I’ll also share a bonus birthday gift along the same lines. Next month, I’ll have a packaging spread that will also work for wedding gifts so if July’s technique isn’t quite your style, hopefully August’s will be. Truth be told, this is a post I’ve wanted to do for a long time, but for one reason or another, I never got around to it until now. I have long-loved the idea of using one big piece to steal the show. 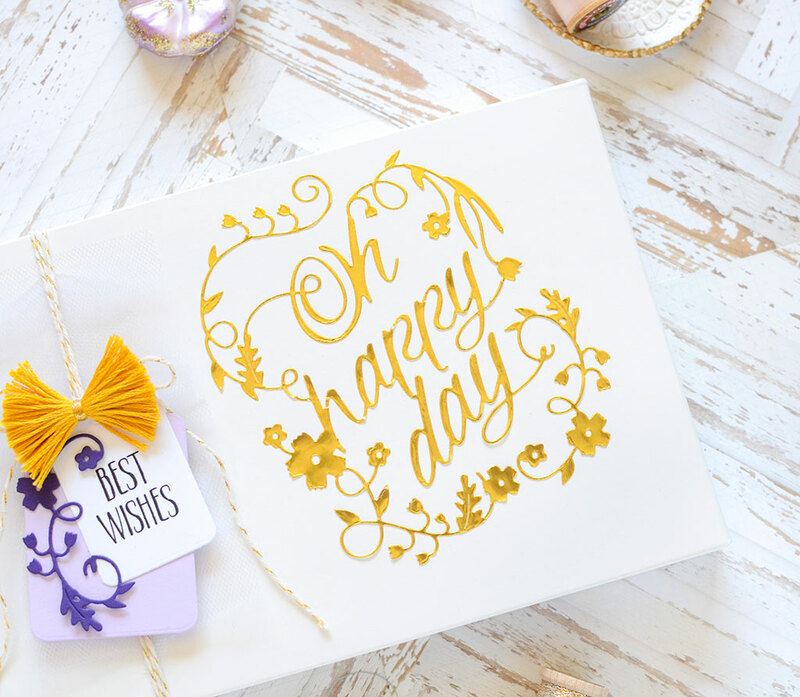 Whilst perusing the Papertrey Ink shop, I came across the Paper Clippings: Oh Happy Day die and knew it was perfect for this idea! Before I get into all the project details, though, first I want to tell you about these boxes I’m using. You can find these in the PTI store, too, and they’re so nice! For $4.00, they come in a set of 2 and you can choose from white, pale pink, or pale yellow sets. They measure 9-3/8″W x 6″H x 1-1/8″D and they’re pretty sturdy. Some easy assembly in required, but I put mine together in a jiffy! 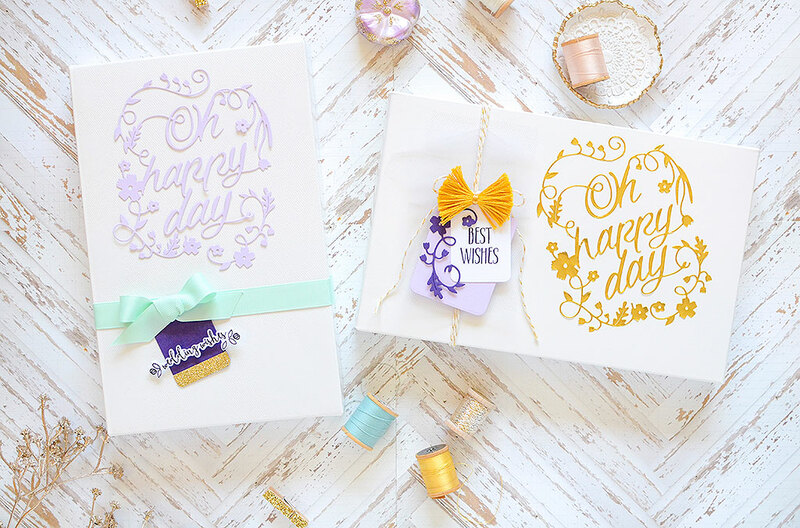 I’m using all white boxes today and they’re a great size to use in conjunction with the Oh Happy Day die. On my first package, I cut the design from a Luxe Gold Adhesive sheet and adhered it directly onto the box. The die has very delicate and intricate designs so it was a bit finicky with the thin foil, but I went slow and pulled the backing off little by little, without pressing the sticker firmly to the box cover until I knew the placement was where I wanted it. That way, I gave myself a little room to maneuver. After I had it where I wanted it, I moved onto the tag. Note that I planned out the entire design BEFORE I adhered the die cut. There’s not much worse than committing a sticker to a surface and then realizing the rest of your design options are few and far between. I cut tags from Lilac Grace and White cardstocks using the Scalloped Tag dies. 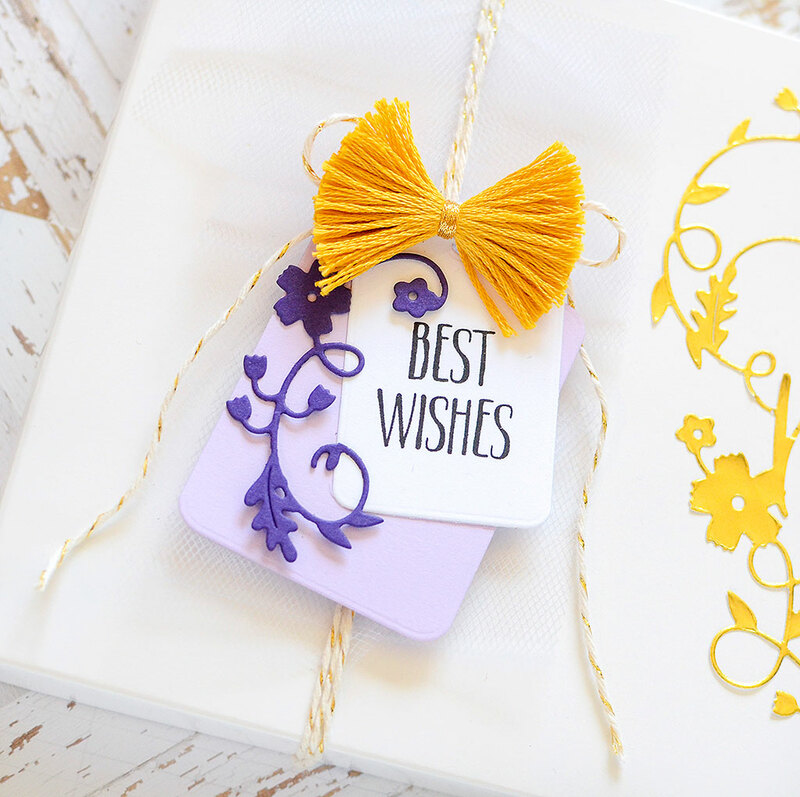 To stamp “Best Wishes,” I taped off ‘Wishes’ and stamped ‘Best;’ then taped off ‘Best’ to stamp ‘Wishes.’ Even if you don’t think you have room on your surface to stamp the phrase you’d prefer to use, try that method and you might be surprised! 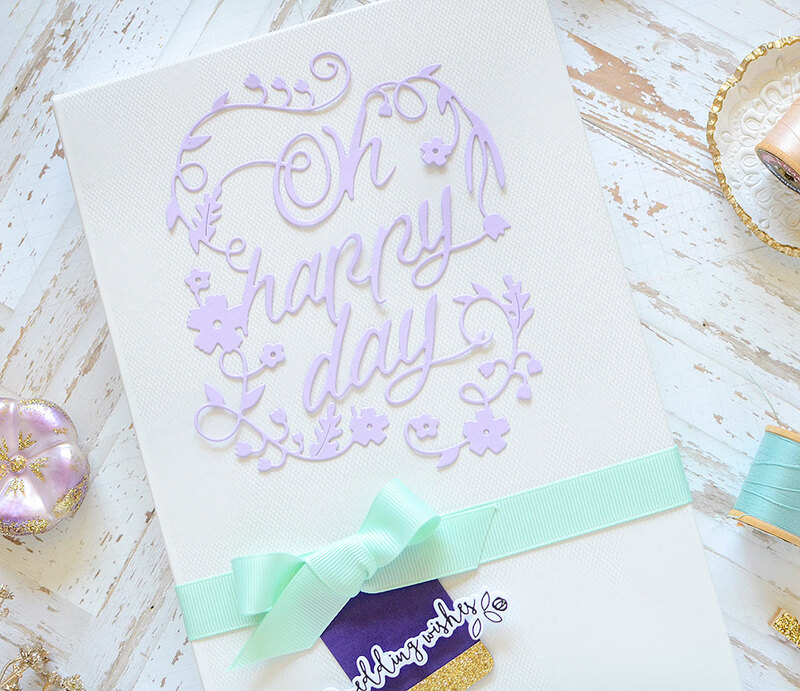 I cut just a portion of the Oh Happy Day die out from Royal Velvet paper and adhered a flourish to the tag set. 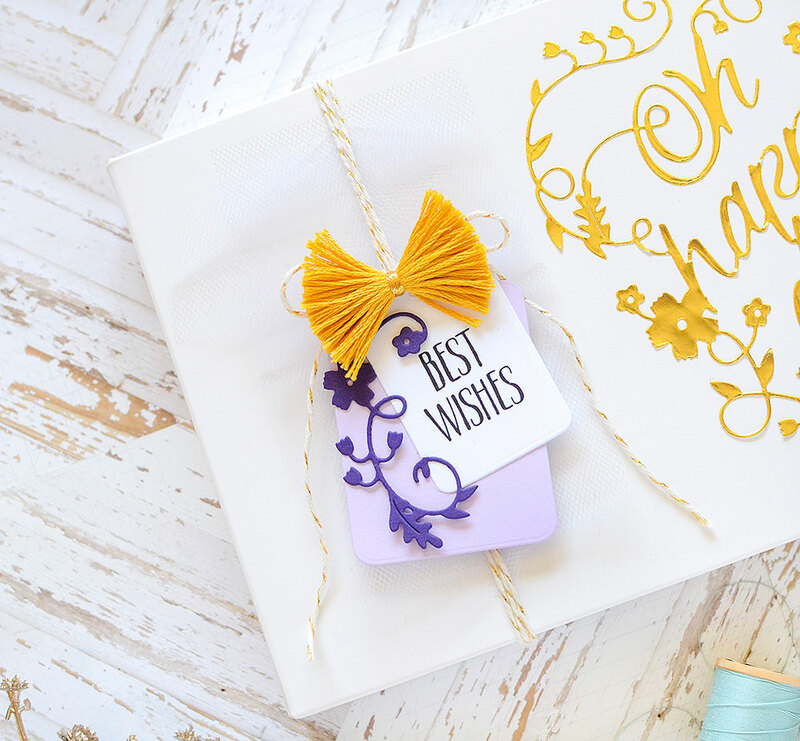 After wrapping gold twine around my box a couple times, I tied the tags on and then added an embroidery floss tassel bow in a deep yellow. These colors are really nice for a later summer/autumn wedding. 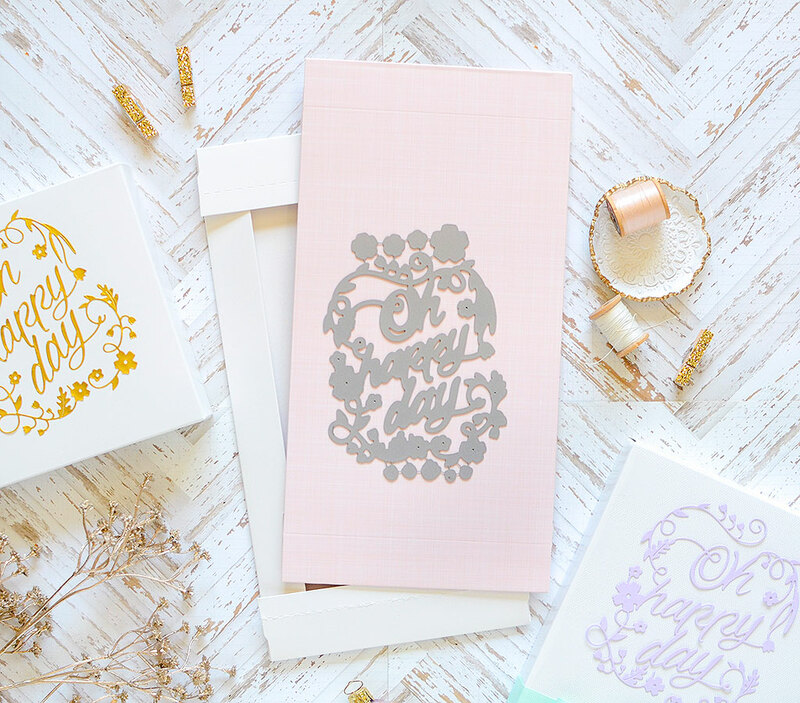 You can also coordinate your colors to go with the colors on the wedding invitation. For my second sample I chose a vertical layout, partly to show you that the die is versatile, and partly to show you that the gift boxes are versatile, too (and fun to decorate!). This time I cut the die out of Lilac Grace stock. I decided to glue it onto pale purple tulle for a little texture, but you can adhere it right to the box and omit the tulle if you’d rather. I used a glue pen from Sakura for the thin trim lines and careful dabs of Fabri-Tac for thicker strokes and flowers. Sandwiching the die cut/tulle duo between wax paper sheets, I placed a heavy book on top of them for 20 minutes to insure a good hold. Once that was done, I adhered the tulle to the box with strategically placed dabs of Fabric-Tac again. The next step was to wrap ribbon around the box and I chose Aqua Mist grosgrain for this. After tying a bow, I slipped a Royal Velvet scalloped tag trimmed in glitter tape underneath it. The final touch was to stamp and cut out “wedding wishes” from the Fancy Foliage set and pop it onto the tag. 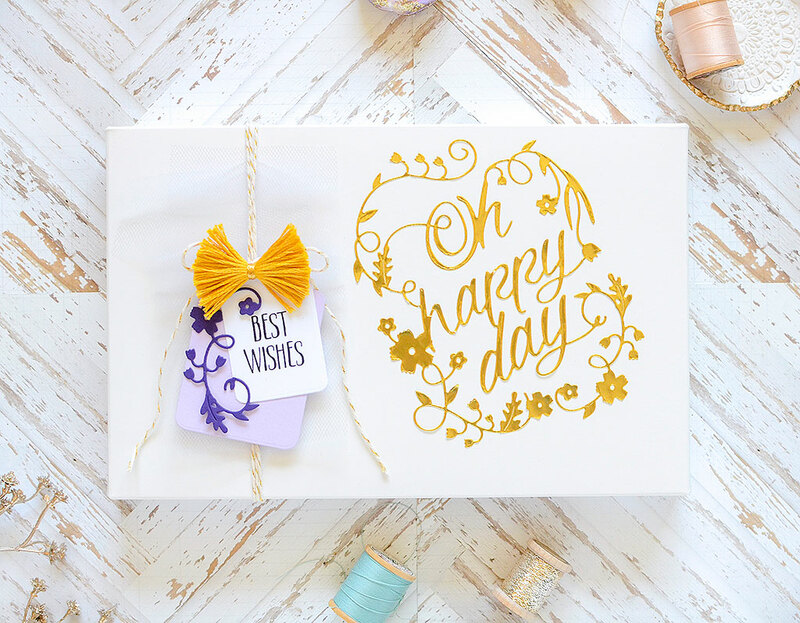 Oh Happy Day is such a perfect wedding package topper! You can also use it to make your wedding card! I chose wedding gifts for this die, but it’s perfect for any type of celebratory occasion. If you’d like to take this idea and use some other dies, check out the full line of Paper Clippings dies! 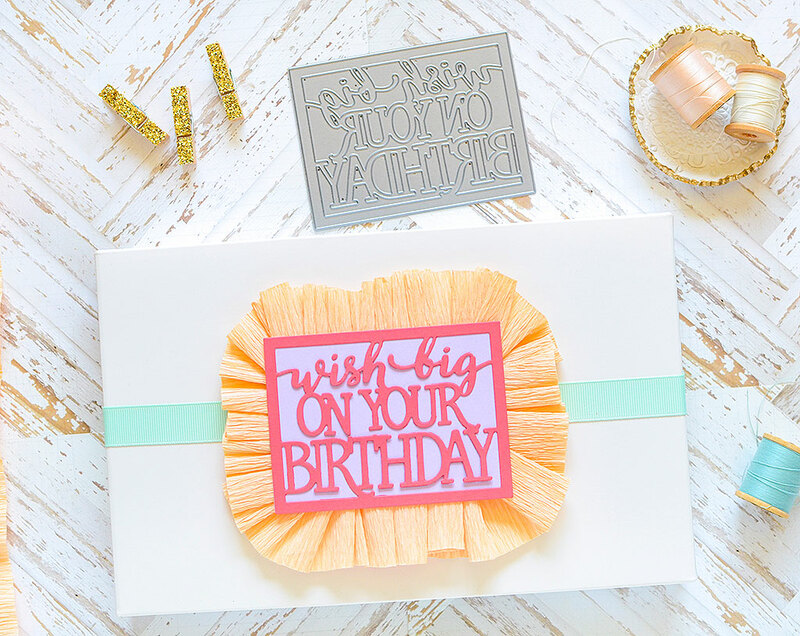 While this die isn’t part of the Paper Clippings line, the Text Block: Horizontal Birthday die is still a nice size to be the focal point of your package. 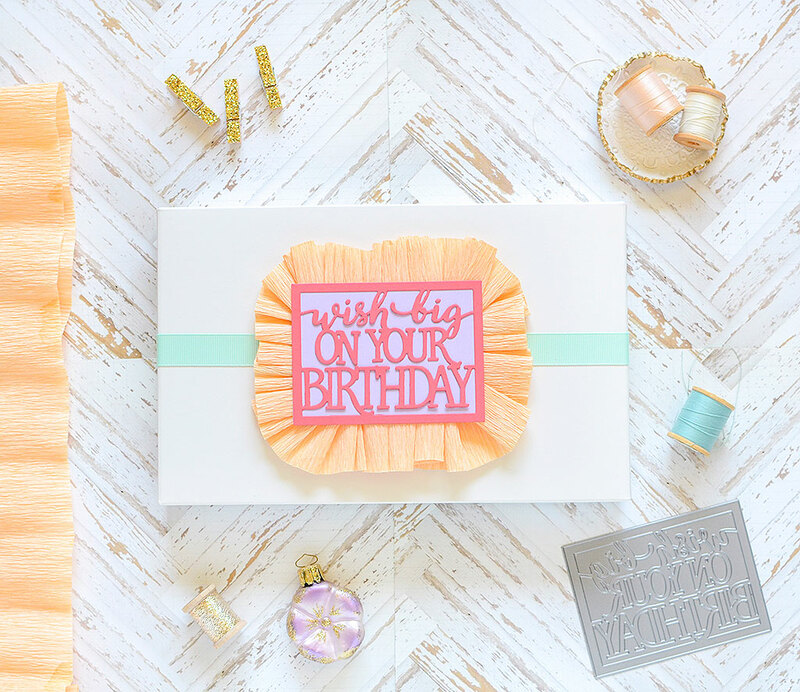 I created this cute birthday wrap with the die and some ruffled crepe paper. I trimmed the die from Berry Sorbet cardstock, and then cut a matching rectangle out of Lilac Grace to matte under it. To make the ruffle, I scrunched up peach crepe paper to adhere behind the die cut set. While waiting for the glue to dry, I wrapped Aqua Mist grosgrain ribbon around my gift box and then glued the finished topper to the center of the box. This package was so, so easy, but it’s so colorful and festive! 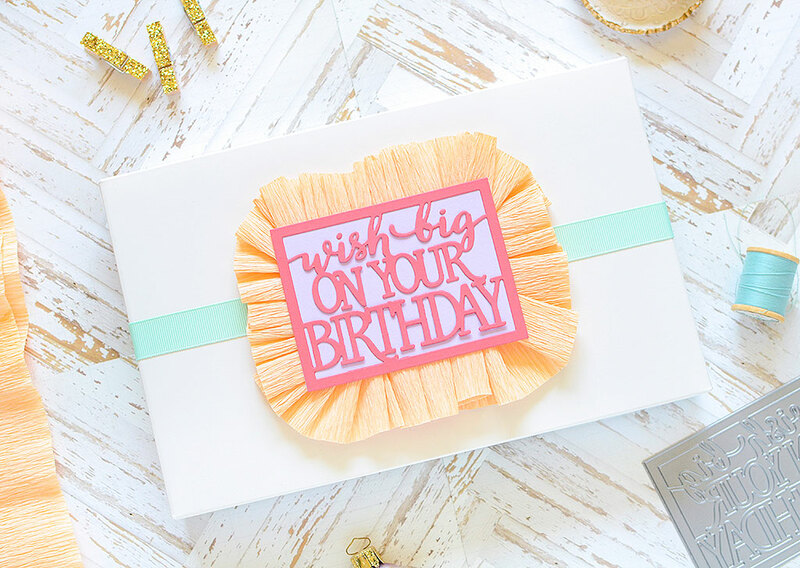 These are fun ways to take those large dies you probably only save for cards and use them to make a big, big impact on your gift wrap. It’s definitely one of my favorite techniques and I hope you’ll try it, too! Thank you so much for spending time with me today, and for your kind comments from last month’s post–they’re always appreciated more than you know. We’ll meet again August 6th! Love the ruffle!! Need to try some ideas with my paper clipping die, thanks for the inspiration! Another series of winners! What lovely colors and they catch your eye immediately! 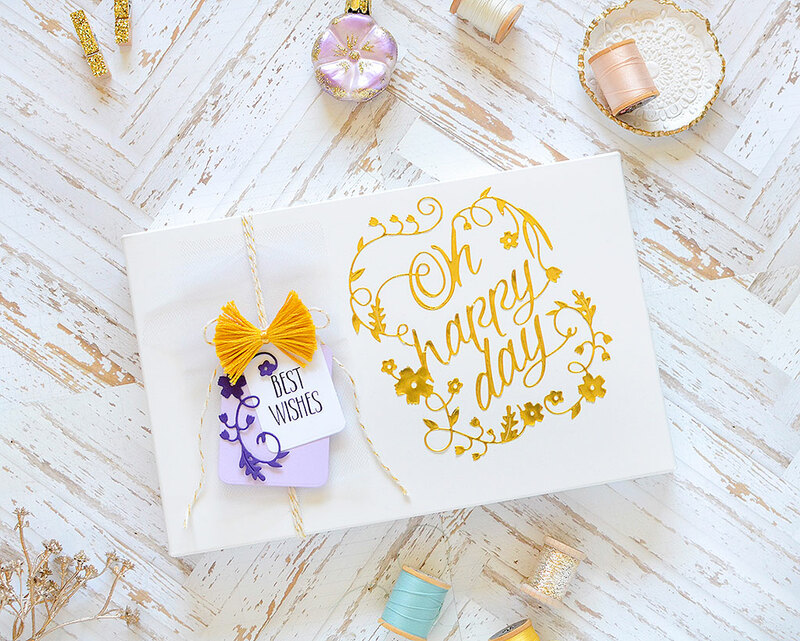 Who wouldn’t be delighted to receive this elegantly wrapped gift! Oh what fun, Rebecca! Your packaging ideas are just lovely and love tgevpops of color. These pretty packages are a gift i themselves, Rebecca! 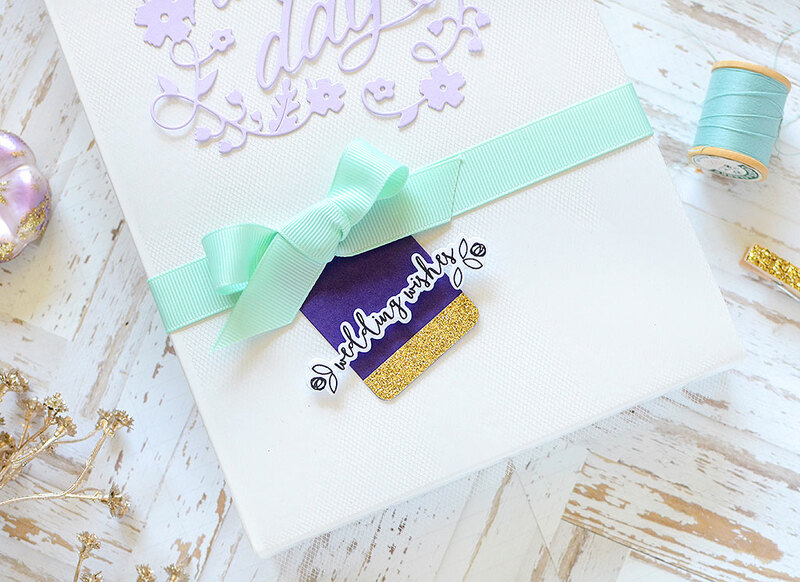 The colors you used are gorgeous and I love the dies as the focal point in gold. You have such a gift (no pun intended) of design! I used to love making fancy package wraps and you’ve inspired me to think about it for something special. Love this feature! Great ideas! They would work especially well for those of us who have to mail packages. My favorite is the last one with the crepe paper. Love these boxes, and the intricate dies !! So Beautiful ! !